Tram tracks are now being laid in Birmingham city centre on the extension from Grand Central (New Street station) to Centenary Square. 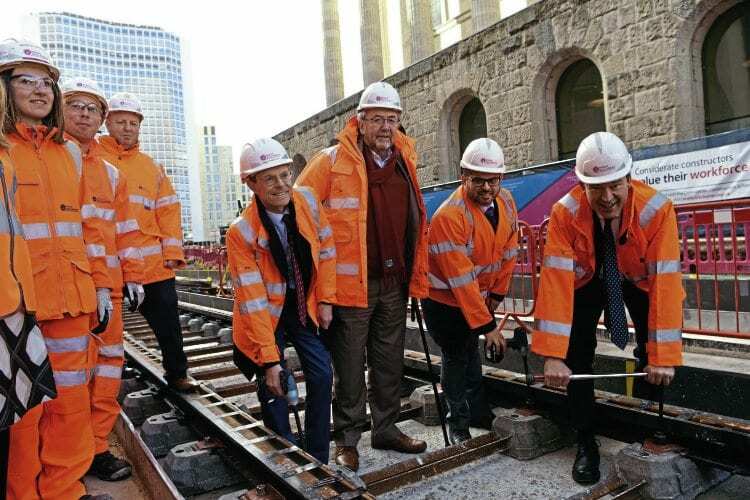 The first rails were ceremonially laid by Mayor of the West Midlands Andy Street and Transport Minister Jesse Norman alongside the Town Hall in Victoria Square on February 7. They are the first trams tracks to be installed in the city centre since 2015, for the extension from Snow Hill to Grand Central, which opened in May 2016. The tracks form part of the first phase of the West Midlands Metro Westside extension, which is due to open to Centenary Square at the end of the year. Read more in the March 2019 issue of The Railway Magazine – on sale now!